Here Comes the Gun Bill: What’s In It? Everything you need to know about the gun control package being debated this week, including what might get weakened. Harry Reid is beginning debate on a gun control package that would create universal background checks. (AP Photo/Susan Walsh). Senate Majority Leader Harry Reid announced Tuesday afternoon he would file for cloture on a comprehensive gun control package that would create universal background checks, dramatically stiffen penalties for straw purchases and gun trafficking, and fund improvements in school safety. Reid will move to begin debate on the bill Tuesday night, and so that vote will occur Thursday. Many Republican Senators have said they are willing to at least allow debate on the gun control package as long as they can offer amendments, which Reid will allow—so Thursday will probably see over 60 votes to kick off debate on the bill. But a contentious Senate floor fight lies ahead. On Wednesday morning, a deal to loosen some of the background check language will be announced. Is it enough to placate far-right conservatives (and some Democrats, like perhaps Montana Senator Max Baucus)? This group might still be able keep the Senate debate from ending and thus prevent a final vote if they can win over just a small handful of allies. What other provisions will be weakened, if any? 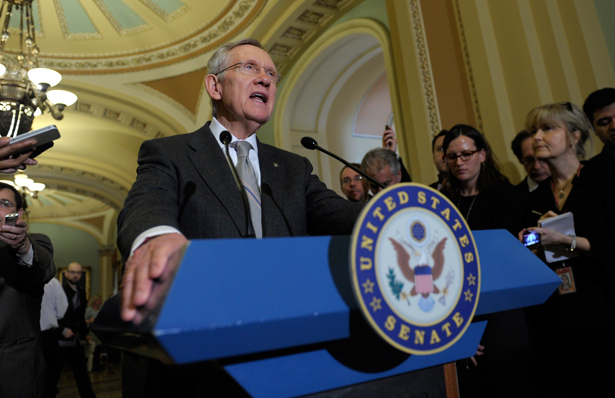 Reid initially moved ahead with the uncompromised bill containing all the language of the Senate Judiciary Committee. (There are no measures on banning assault weapons or limiting magazine clips, however—though Reid will allow separate votes on both as amendments.) Now, presumably the language will be amended to reflect the Toomey-Manchin compromise. Here’s a comprehensive guide to what’s in the bill the Senate will now consider, with special note of where Senators really want to make changes. Right now, FBI background checks are only required for commercial sales—meaning that people can make purchases at a gun show or online and avoid any kind of background check. “bona fide gifts” between immediate family members or grandparents. A transfer of a gun from a decedent’s estate, pursuant to a legal will. A temporary transfer, but only ones that last less than seven days and where the gun doesn’t leave the licensed owner’s home or property. Temporary transfers a shooting range or shooting competition, so that customers or competitors don’t have to bring or buy a gun. Between individuals while hunting or trapping, provided it’s happening in-season and the transferee has any necessary hunting licenses. How many more gun purchases would now be subject to a background check, where they weren’t before? The statistics are fuzzy. President Obama and gun control advocates claim as many as 40 percent of gun sales don’t pass through a background check, but as it turns out that’s based on a 1994 study of 251 people, and included three years where background checks weren’t even required. Controlling for gifts and inheritances, which are still allowed under this bill, the number in that study drops to 26.4 percent. More recent, conservative estimates say somewhere between 14 and 22 percent of gun purchases aren’t subject to a background check but would be under the new law. The bill also requires records of these transactions to be kept. Proponents argue this is the only way to ensure the checks are happening: the FBI already must delete background-check requests within 24 hours, so if dealers don’t keep records themselves, there’s no way to verify checks are actually being performed. In addition, it gives law enforcement the ability to track guns used in crimes. But pro-gun Senators like Orrin Hatch are fear-mongering about the record-keeping: “When you start saying people all have to sign up for something, and they have a database where they know exactly who's who, and where government can persecute people because of the database, that alarms a lot of people in our country, and it flies in the face of liberty,” he said in February. Others contest enforcement could still occur without records, through spot checks and post-facto prosecutions if someone who bought a gun without submitting to a check commits a crime. On Wednesday morning, Republican Senator Pat Toomey and Democratic Senator Joe Manchin, who both have 'A' ratings from the NRA, will announce a compromise that seems pretty decent from a gun control perspective. Crucially, they agreed to allow record keeping, and to expand background checks to gun shows, online purchases, and any other commercial sale that advertises. It appears they will propose language that widens exemptions for personal and family sales, however, to go far beyond the narrow restrictions described above. The gun control package also aims to boost state participation in the background check system: a recent Mayors Against Illegal Guns report shows that 21 states have reported fewer than 100 mental health records to the FBI’s National Instant Criminal Background Check System (NICS). There are significant Constitutional questions about whether the federal government could compel states to submit this mental health data, as it might violate the Tenth Amendment, so the bill uses carrots and sticks to get it done. The bill would increase funding for states to build systems to comply with the law, authorizing $100 million each year until 2018. It would also increase penalties for noncompliance: in the first two years of the bill, the Attorney General could withhold up to 3 percent of federal crime control funds if the state provides less than 50 percent of the records required; after three years, states muse provide at least 90 percent of the required records or face up to a 5 percent loss of funding. Also, within one year the Attorney General would be required to create a public website that ranks each state by their estimated compliance ratio, and to update it every year thereafter. In addition, the background check section of the bill makes it a federal crime for any person to fail to report the loss or theft of a gun within 24 hours after discovering the loss–something Republicans like Senator Chuck Grassley are already blasting. It would also clarify that federal court records should be fed into NICS, which is expected to be non-controversial. Even if a completely universal background-check system is achieved, there’s one problem: people who know they would fail the background check, but obtain guns through traffickers or straw purchasers that won’t. Law enforcement officers have frequently complained that straw-purchasers undermine gun laws and flood the streets with weapons, and there’s little recourse: today, if you make false statements in relation to a firearm purchase the most you can be charged with is a federal paperwork violation. The Hadiya Pendleton and Nyasia Pryear-Yard Anti-Straw Purchasing and Firearms Trafficking provisions of this bill would make it a felony to be a straw purchaser, meaning that a person buys or even conspires to buy a firearm for someone other than him or herself who is prohibited from owning it. It would subject that person to up to 15 years in prison, or as high as 25 years if the straw purchaser knows or should have “reasonable cause to believe” that any firearm will by used to commit a violent crime. The measures are named after two recent teenage victims of gun violence in Chicago and New York City, respectively. Pendleton was the young girl who was killed only days after performing at Obama’s second inauguration. There are very narrow exemptions for people buying guns to give as gifts, or for use in a contest or raffle—but the recipient must still pass a background check. Similarly, gun traffickers face much tougher penalties under the legislation. A person who transfers or receives two or more weapons if he or she “knows or has reasonable cause to believe” that the weapons would result in the violation of any federal law that is punishable by a prison term exceeding one year, would themselves be charged with a felony and face up to 15 years in prison. And once again, if the trafficker knows or should know that the gun will be used in a violent crime, the penalty goes up to 25 years. In all cases, the legislation would allow the federal government to confiscate the straw purchaser or trafficker’s firearms and ammunition upon conviction. As a result of the Fast and Furious fiasco, the bill also forbids the federal government from setting up any kind of sting operation where straw purchasers are used or allowed unless the Attorney General expressly authorizes it in writing. These provisions were long seen as the “low-hanging fruit” of the gun control debate; Republican Senator Susan Collins is a co-sponsor of the original legislation and even Senator Charles Grassley, the ranking Republican, voted for it during Judiciary Committee debate. But the NRA has since demanded that the legislative language be weakened: they want to criminalize only straw purchases where authorities can prove the straw purchaser knew the customer wouldn’t pass a background check or was going to commit a crime. Mayors Against Illegal Guns has said that’s a “ridiculous” standard that would keep many straw purchasers from being prosecuted. The NRA also wants to scrap the provisions on confiscation of any weapons belonging to convicted straw purchasers or traffickers. While Grassley voted for the provisions in committee, he hasn’t committed to voting for them on the Senate floor. Without naming the NRA objections in particular, he told The Hill that “that there were changes that needed to be made before I would support it on the floor.” With the NRA whipping against the provisions, they could be in real danger. These are the truly non-controversial parts of the package among Senators: they passed the Judiciary Committee 14-4. If enacted, the bill would re-authorize through 2023 a Justice Department program that expired in 2009, which gave school districts grants to develop security plans. It would provide $40 million annually for school districts to develop and implement safety plans, up from $30 million the last time the program existed. (Senator Barbara Boxer, the author of these provisions, originally wanted $100 millon annually but pared it back to win over Republicans.) It doesn’t mandate that school districts hire armed guards, as the NRA has demanded with much fanfare, but would allow school districts to use portions of the money to do so. Two additions to the previous program are worrisome: specific language allowing the purchase of “surveillance equipment” by school districts, and money for the establishment of “hotlines or tiplines for the reporting of potentially dangerous students and situations.” Some civil liberties and youth justice advocates are decrying these little-noticed provisions, but it’s unlikely there are enough votes—or any, at this point—to remove these provisions. Beyond that grant program, the bill would also create a brand-new National Center for Campus Public Safety, which would be run by the Department of Justice and focus on security at colleges and universities. The center would help train police officers on college campuses, foster research about campus safety, and promote information sharing about best protocols and practices between colleges and various government agencies. This post has been updated to reflect evolving language in the gun control package.